Low in calories, low in carbs, good source of protein, full of antioxidants (both the lentils and the spices), and really, really good when coating a piece of spicy grilled chicken. To be frank, this recipe has a lot of unnecessary words. If you find yourself alone with a bag of lentils - and you don't know what to do - just boil them, spice them, and you've got a meal. This recipe makes about 3 or 4 small servings but can be multiplied. 1 Rinse beans (no soaking needed) and place them in a small pot with 1 1/4 cups of water. Cover, leaving the lid slightly ajar. A small Dutch oven works well. Turn the heat to medium-low until you just see a simmer, about 5 minutes. Simmer at the absolutely lowest setting for about 20-25 minutes. Turn off heat and cover. Notes: Photo on the right above is of Beluga lentils. 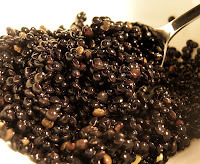 When wet, these lentils resemble Beluga caviar which can be seen in the photo to the direct right. These lentils (Beluga or French) are very forgiving. They won't break apart or turn to mush if overcooked, as will their brown and pink cousins. Also, because they keep their shape, they lend themselves to cold salads. After about 15 minutes check the water level. Depending on how loose your lid is, the water may have evaporated away or been absorbed. If so, add another 1/4 cup of water, cover, and continue simmering until the beans are soft. 2 Sauté onions and garlic in olive oil. Cook on low heat to just wilt them, or turn up the heat until they brown slightly, your choice. Allow to cool for a minute or two in the pan before adding them to the beans. 3 Add about 1/4 cup water (or wine) to the pan the onions and garlic were cooked in, swirl to dislodge brown bits, add to beans. Gently stir in the spices and the last 5 wet ingredients. Bring to a simmer again and heat at lowest setting for about 5 more minutes with lid off. Notes: You may add a little more water if you like a slightly soupy texture (as seen in the photo above), or you can keep the water to a minimum and serve a drier side of beans. I served these lentils with grilled chicken and a sautéed red pepper and zucchini side dish. De-lish! 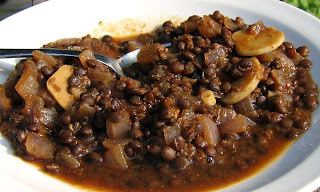 Tip: This recipe can be converted to a lentil soup easily by adding a few cups of stock (chicken or vegetable) when the beans are done but before you add the spices. (You could cook the beans in stock but they will take longer to soften.) Chopped raw vegetables, previously sautéed or not, can be added and simmered with the stock (e.g. diced carrots, celery, peppers, broccoli, green beans, etc.). Always add the spices and those last 5 wet ingredients at the very end. Some spices will turn bitter if cooked too long (e.g. turmeric). And acids like lemon juice and vinegar can turn green vegetables like broccoli an unappealing shade of grey. I think we will try this, hopefully our rice miso will be OK.